To increase the chances of pregnancy, insemination is generally combined with ovarian stimulation which is achieved through oral medication or subcutaneous injection. 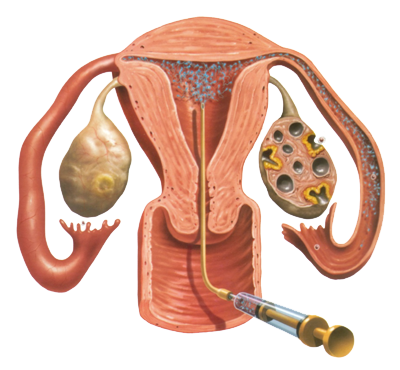 Insemination is performed when ovulation occurs. This is determined with the help of an ultrasound scan and a blood test. Either the partner’s or a donor’s sperm can be used. The pregnancy rate following an IUI cycle is 15 to 20%. A study carried out atSaint-PierreUniversityHospitalshows that 94% of pregnancies occur after 4 cycles of intrauterine insemination. If there is no pregnancy after 4 cycles, couples are then offered other options. Insemination is not recommended in the case of severe pathologies, in patients over 40 years old or if the patient has been infertile for more than 4 years.